Kaepernick is unsigned after opting out of his contract with the 49ers. Many believe he's being punished for protesting police brutality by refusing to stand during the US anthem. 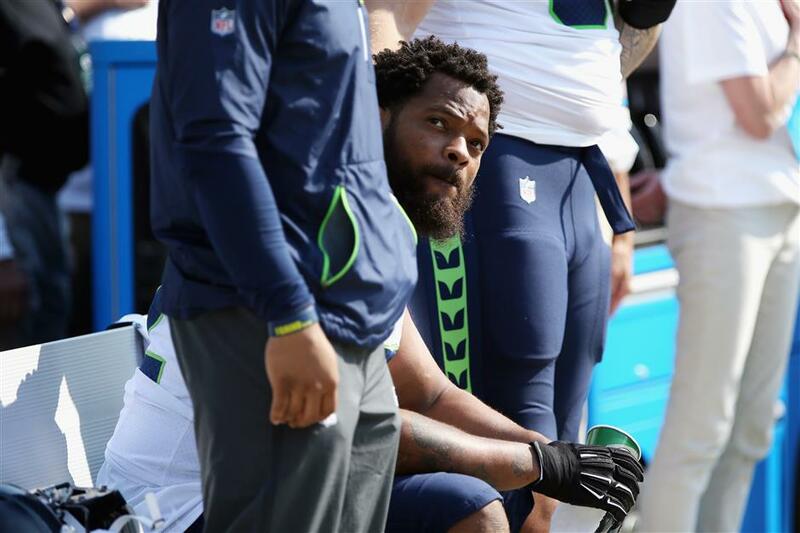 Seattle Seahawks' Michael Bennett sits on the bench during the US national anthem prior to the NFL game against the Green Bay Packers at Lambeau Field in Green Bay, Wisconsin, on September 10, 2017. Colin Kaepernick's protest movement rolled on without him Sunday, as his fraternity marched in Detroit and players around the National Football League sat or knelt during the national anthem. Kaepernick remains unsigned after opting out of his contract with the 49ers. His supporters believe he's being punished for protesting police brutality by refusing to stand during the US national anthem last season. About 50 members of the Kappa Alpha Psi alumni chapter in Detroit marched about a mile on Sunday in a peaceful protest that ended just outside Ford Field, where the Lions hosted the Arizona Cardinals. "When you look at some of the recent incidents like what happened to Michael Bennett in Las Vegas , it validates the stance that Colin Kaepernick has taken," said Eric Brown, a former president of the fraternity's alumni chapter in Detroit. Bennett sat for the national anthem during the preseason as well, with teammate Justin Britt standing next to him with his hand on his shoulder. Britt again stood next to Bennett during his anthem protest on Sunday. Defensive linemen Frank Clark and Cliff Avril each went back during the anthem to shake hands with Bennett. "I thought it was pretty cool," said 10-time Pro Bowl tackle Joe Thomas. "I think doing that shows the unity that this team is trying to promote between our football team and first responders, military, police, and hopefully show a positive effort to move forward and to try to make America a better place for everybody."